When we moved to Arizona from San Diego we sold almost all our furniture because a) we knew we would be in my parents' house and wouldn't need anything nor did we want to store it and b) a lot of our stuff was cheaply made and we weren't attached to any of it and c) I have a disease called "every six months I want to start over from scratch"... not that I can, but the desire is there! That's why I often feel the need to rearrange the furniture or acquire a new pillow often. I blame my mother. Some of my best memories of spending time with my mom at home as a teenager, involve us staying up late into the night and rearranging the living room furniture into a fresh, new way. We both got so much pleasure out of trying something different, whether that was just moving the sofa to face the front door instead of the fireplace or picking out new fabric to reupholster a chair. After selling everything, I knew that I didn't want to buy another cheap piece of IKEA furniture for our next house. IKEA has some great deals and there are a few items there that I definitely am all about, but from personal experience, I knew that I was tired of buying something that was going to fall apart on me in a few years (or months) or that I was buying because the price was right. At the same time, I don't have a disposable income to spend $5,000 on a sofa, so I'm often left feeling frustrated in that "in between" place. If you troll Craigslist long enough, sometimes you can find awesome deals. You can certainly find a lot of junk on Craigslist and you really have to know what to look for when you're searching. I don't have any formal training on the best, well-established furniture companies, but I do have my mother, who taught me economy but she also taught me that certain things are worth the cost (kind of like a great pair of well-fitting jeans = splurge, while a trendy accessory = save). 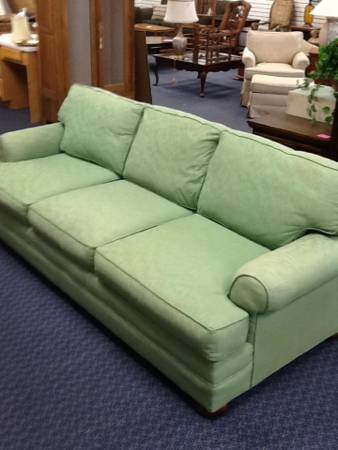 I recently found this Lee Industries sofa on Craigslist for $99. It is in awesome, classic shape and really comfortable and well made (I did know that Lee Industries is a good company with a long standing of quality furniture). I'm pretty sure that the previous owners kept plastic over it since the fabric was almost spotless (except for some light fading on the top cushions), but it had to go. The green shade wasn't doing it for me and it was terribly scratchy so I found a good deal on some gray microvelvet (similar to this shade) at Mesa Sales that I'm really happy about. It's a beautiful fabric that's super soft and durable and I think it'll go well with anything. 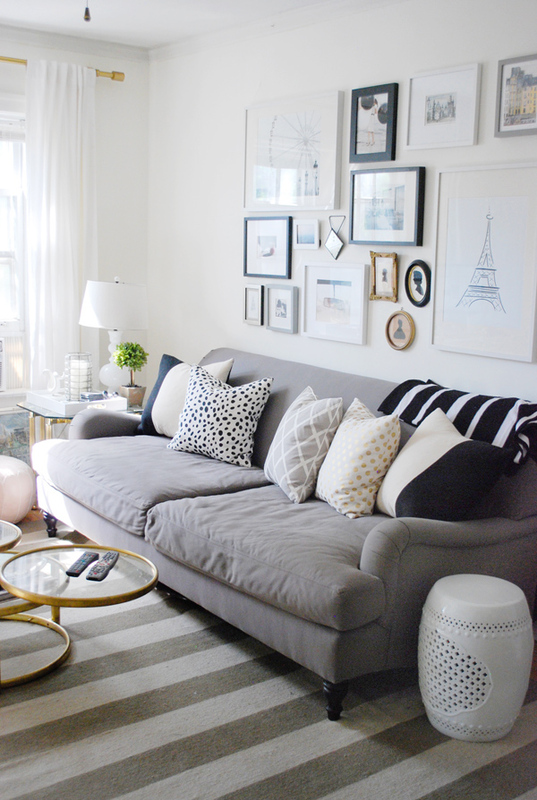 As much as I love a white sofa, I learned my lesson (with a black Sharpie a week before we moved) last time. Even though I could wash the slipcover, it was just too much work with my small kids and our lifestyle so I'm happy to have a classic shaped sofa that will soon have a wonderful reupholstery job done on it which will hopefully be finished a week or two after I have this baby! I just sent it off today and I'm so excited! I'll share pictures of the finished product soon. so excited to see the finished product!!! Who are you using to reupholster? I have a chair..
And love all your recipes!! We just moved to east Mesa about a year ago and I don't know anyone for home repairs. Could you do a follow up post with sofa pictures please? Yep, Stephanie. He's great! I am really happy with the quality.